Mad For Garlic is restaurant that I read about when I first arrived in Korea. It was profiled in the first Lonely Planet that I bought before coming to Korea 4 years ago. It has always been a great place for some excellent Italian food, and a wide selection of wine. Jill and I decided to visit this old friend before we saw Wicked at the Charlotte Theatre in Jamsil. Needless to say, like an old friend, MFG delivers. How to get there: Mad For Garlic is a franchise that is found throughout Korea and Singapore. To find the location nearest to you, check out their website. 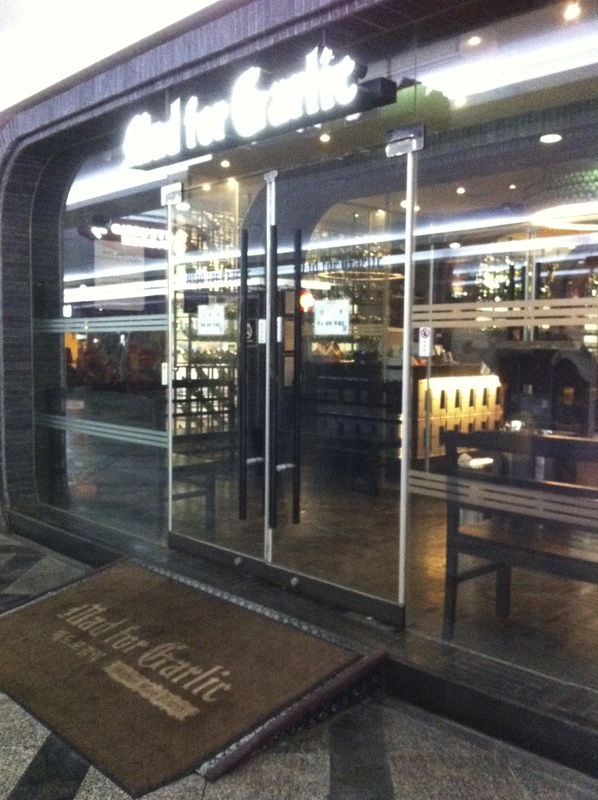 The Jamsil restaurant is easy to find, but you need to take a walk around the Lotte Hotel. The best way to do this is to take the subway to the Jamsil (Line 2) and depart from Exit 4. 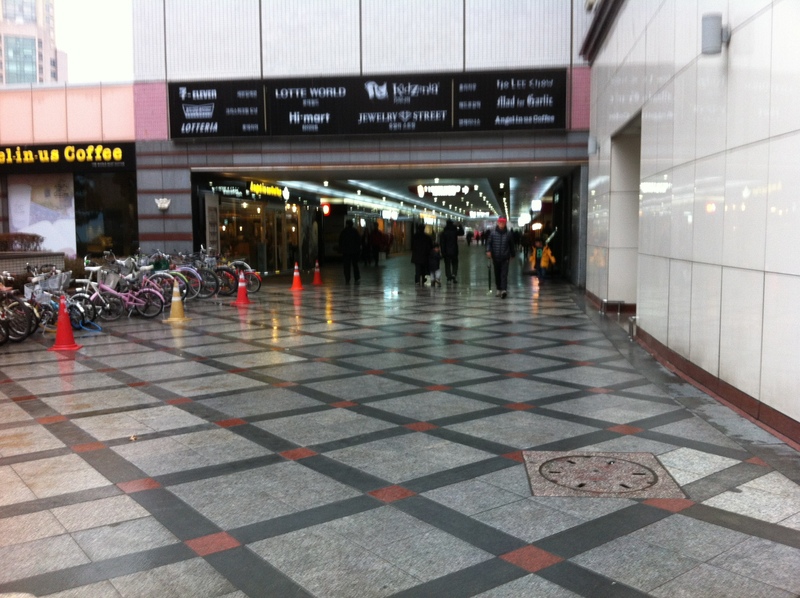 Now as you exit you will see the Lotte Hotel on your right. You need to literally walk around it, and passed the Charlotte Theatre. You will also pass a Tomatillos and eventually you will see a plaza which serves as the entrance to Lotte World. Mad For Garlic is the first restaurant on the right inside the plaza. Atmosphere and Service: The lights are dimmed, and the stone walls reflect the flicker of candlelights. It has the ambience of a gothic castle in eastern Europe. Rows and rows of wines line the walls, the nectars of the Gods calling at us as we are seated. Although we normally go to Mad For Garlic on special occasions, we don’t find it pretentious. Although you can make it pretentious if you want, there are families at the restaurant, and people who are dressed casually. Service has always been great at Mad For Garlic. The menus are in English, as well as Korean. The servers are fairly prompted, especially when some of the dishes are quite spicy. If Dracula was a drunk, he would hide here. 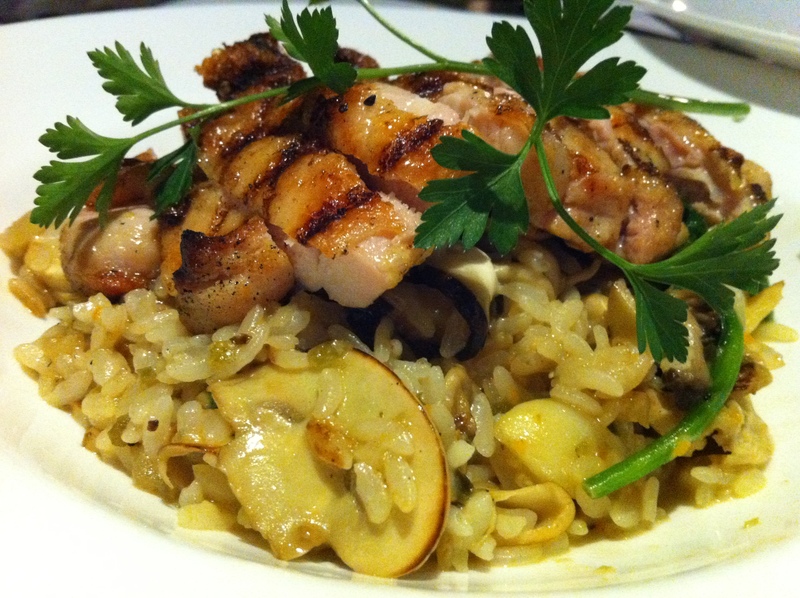 Food and Drink: We ordered the Garlic Bread Tower, Grilled Chicken and Mushroom Risotto, Old Ham and Mushroom Pizza, and the Chicken and Cream Spinach Pasta. We also order a half bottle of merlot, but I honestly forget the name. Sorry folks. Garlic Bread Tower (8600KRW): The garlic bread tower is a massive carb-loaded starter that will probably not make you popular with your date. However, since Jill and I both love garlic, we dived right in. The server brings it out for you in the shape of a tower, and then mashes the garlic and the bread together to make it flat. After they cut it up, you get to enjoy the most flavorful garlic bread in the city. Although I personally love it, they pack it with garlic, at least three cloves and some people might be overwhelmed. However, if you are a garlic junkie like myself, dive it. 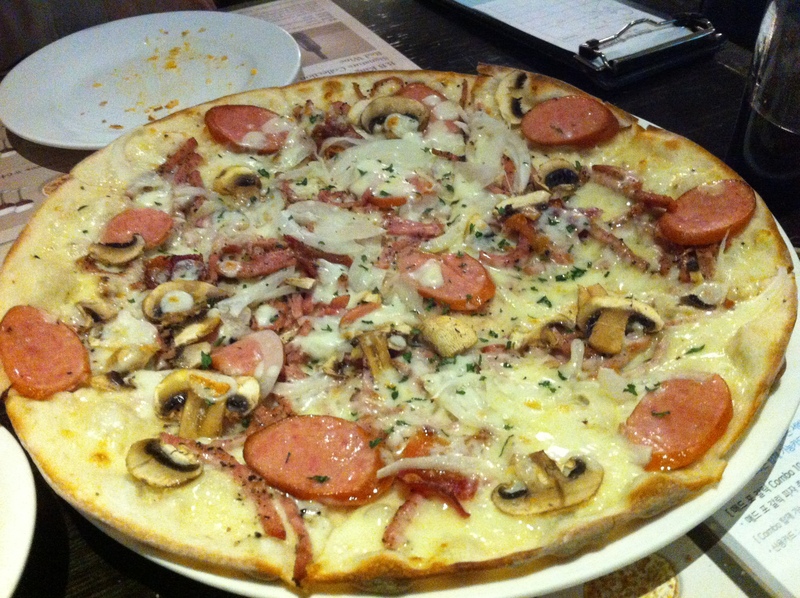 Old Ham and Sausage Pizza (20,800KRW): We decided to split a pizza to start. The Old Ham and Sausage pizza on a cold winter night was the perfect choice. What makes this spicy pizza unique is that the chefs use a creamy, sweet white sauce instead of a traditional tomato sauce. The creamy white sauce is sweet, but has a little kick as it is seasoned with black pepper. 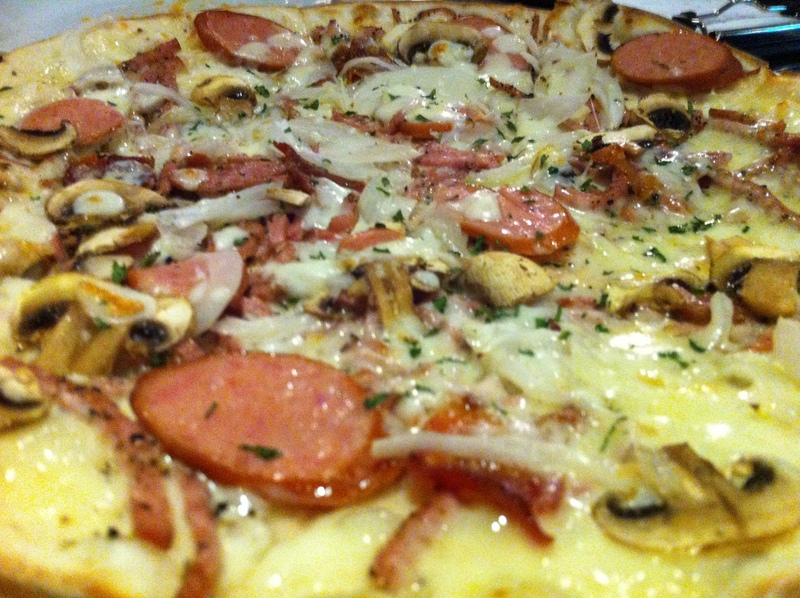 The pizza includes mushrooms, onions and a generous portion of sausage, bacon and ham. 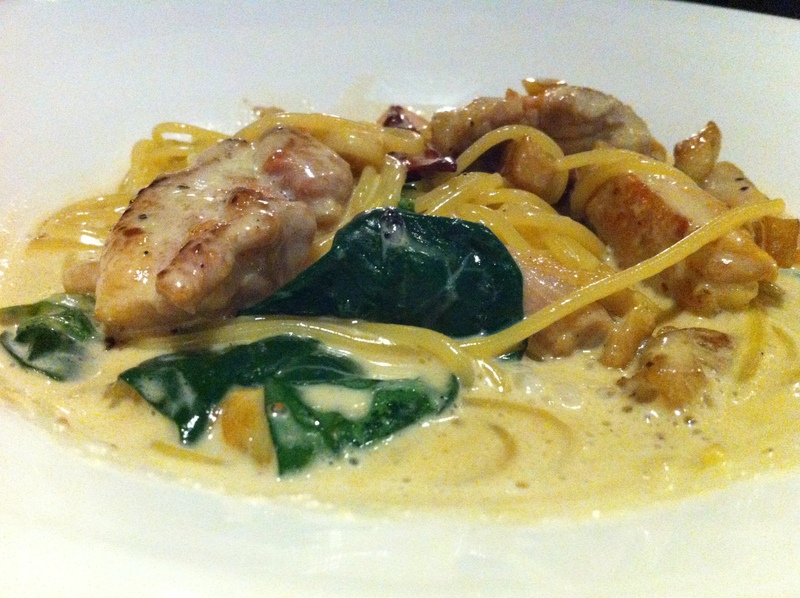 Chicken and Spinach Cream Pasta (20,800KRW): The most curious dish of the night. The chicken and spinach pasta topped with a creamy alfredo sauce had a lot of heat to it. Now, it is advertised that the chicken is spicy, but it was pretty overwhelming for our taste. 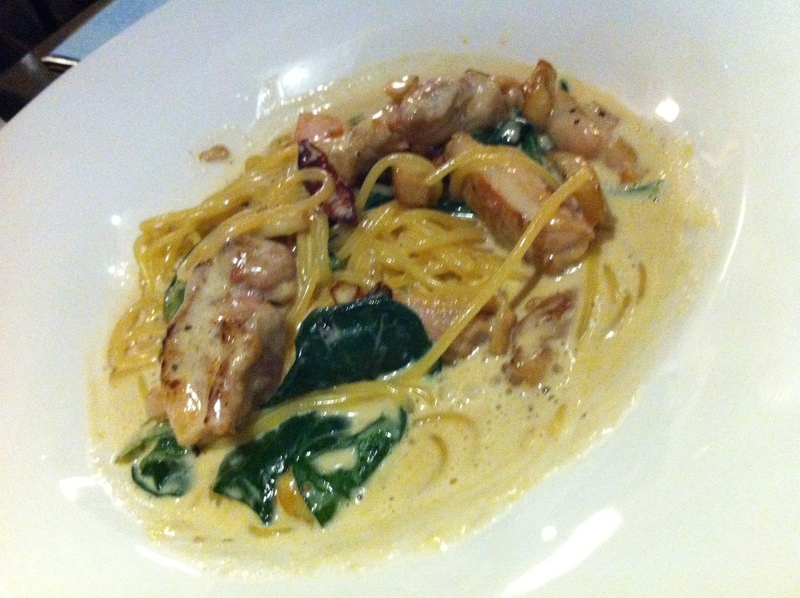 The pasta was cooked nicely, and there was a generous portion of chicken and spinach. However, we couldn’t get pass the heat of the dish. Possibly someone dropped the pepper shaker into the sauce. My tongue is still smoking. Kimchi scale a solid 8. Value: The whole meal was approximately 98,000KRW. 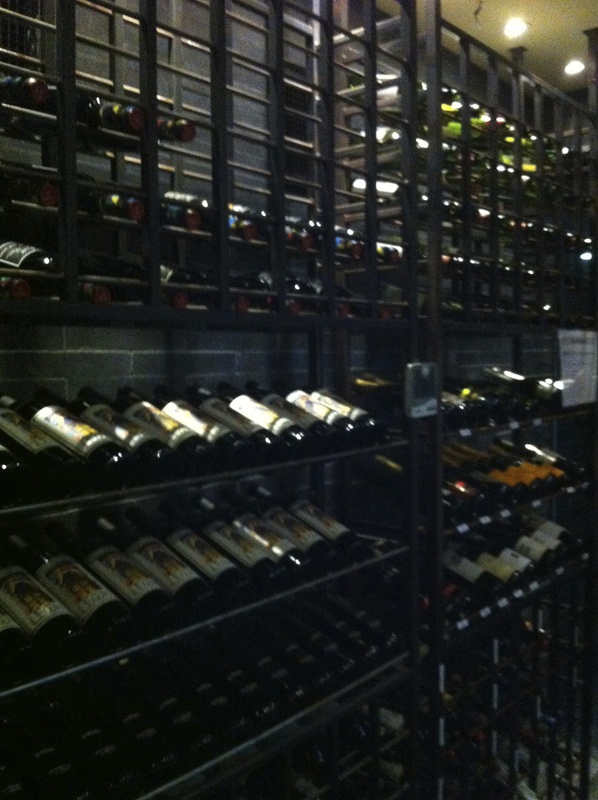 The food is great and the wine selection is extensive. 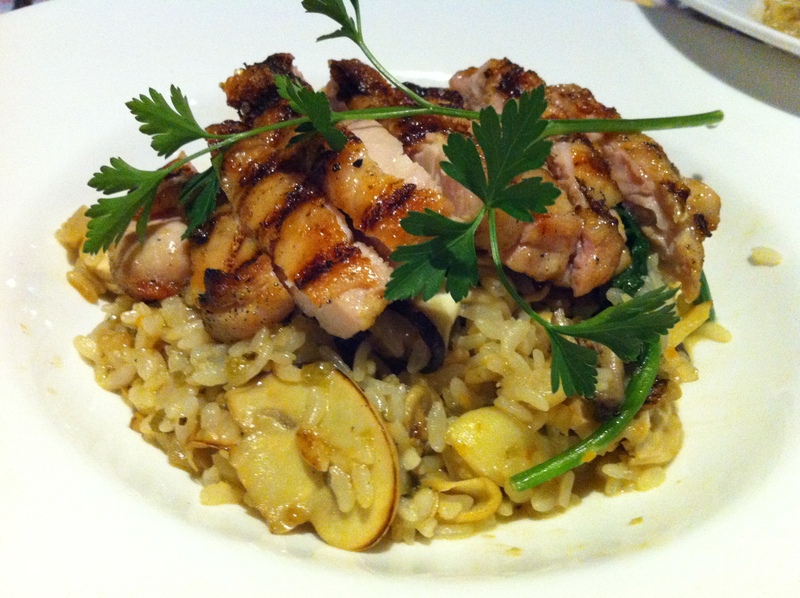 You can tell that the chefs put some care into their food and they use quality ingredients. Although it is a franchise, it still is a great restaurant, with an excellent atmosphere. However, budget travelers should be wary of MFG. You can get cheaper Italian food at many restaurants throughout the city. 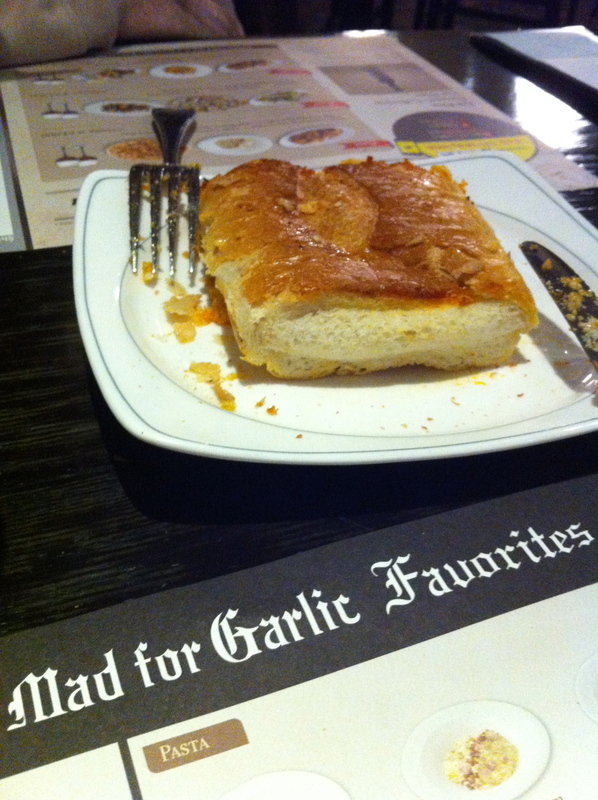 Who Should Visit Mad For Garlic: As the name suggests, this restaurant is a mecca for garlic aficionados in Korea. Want to leave the kids at home and have a nice, romantic Italian dinner? Check it out, but bring the credit card. Who Should Avoid Mad For Garlic: A heavy price tag. Budget travelers would be wiser to find other places in the city to fill their Italian cravings. Looks good! I always wanted to eat there, but my boyfriend doesn’t like garlic as much as I do. So never got the chance to check it out.